If hemp fiber is so strong and easy to grow, why is so much of it moldering in barns awaiting a buyer? Two hemp companies say they have the answer, and they plan to bring it to farmers who can’t find buyers for hemp’s tough stalks. 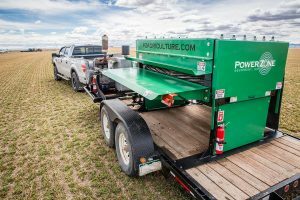 HempLogic in Washington state and Power Zone Agriculture in Colorado plan to load mobile decortication machines onto trucks and then take the equipment on a 20-state tour of hemp farms. The companies are calling the tour HempHub. Making it profitable to turn hemp stalks into usable manufacturing material, a prospect that currently eludes most hemp producers in the United States. “When you put fiber on a truck, when it goes any distance past 100 miles, any profit is gone,” said Cory Sharp, CEO of HempLogic, in Moses Lake, Washington. Sharp, who grows and processes hemp, says the dearth of processing has kept the U.S. hemp industry limited to mostly seed and CBD production. The very toughness that makes hemp more durable than cotton also makes the plant expensive to move. That also helps explain why industrial hemp products manufactured in Asia are almost entirely grown in Asia. It’s simply not economical to move hemp from Canada or the United States to large textile manufacturers overseas. Another big obstacle in producing any type of textile crop is finding an industrial decorticator, which strips the softer outer bark, or fiber, from the woodier core of the plant known as the hurd. Sharp partnered with Power Zone, a Center, Colorado-based manufacturer of farm equipment, to produce a new decorticator machine. The machine costs about $2 million to $2.5 million, processes 10 tons of hemp an hour and can be transported by trucks. Right now, the only mobile decorticators in the United States are fed by hand and therefore limited when it takes tens of thousands of acres to produce profitable hemp fiber. “This is a game changer,” said Corbett Hefner, vice president of research and development for Power Zone. The company plans to sell up to 15 decorticators in addition to the traveling HempHub in 2018. “If you talk to anybody in the hemp industry,” Hefner added, “they’ll tell you there’s a huge disconnect between the producer and the end user. Sharp’s company will bring the mobile machine to farmers with fiber to sell, then evaluate the product for suitability. HempLogic will then quote the farmer a price per ton, process the fiber and then sell it. Varieties with clean fiber could use the hurd for textiles; bales that have gone moldy or have inferior fibers could still find a use in hemp-based building materials or animal bedding. “We’re going to work with everybody to get them paid what we can,” said Sharp, who believes he could process and sell 10,000 acres worth of hemp fiber in 2018 – more than the United States is currently growing. The decorticator won’t fix all the hemp industry’s processing issues. But the HempHub could change an American hemp market that’s currently limited by a lack of processors, said Geoff Whaling, head of the National Hemp Association. “We are going to need multiple decortication solutions, but this could certainly be one of them,” said Whaling, who is not involved with the HempHub project. Sharp is bullish on the prospects for growing the anemic U.S. hemp fiber market. “I’ve got buyers all lined up. People are interested in this market, and they’re willing to pay,” Sharp said. “The problem is, they just can’t get it. Legalization of the plant now. may I say that wholesale regional Hubs with SRI data can grade Mj and prepare it for sale at the retail level. Decordicator can also be built regionally. Regional seems to be the efficient way to do Hemp and Mj, a Co-Op could afford to buy or build machines for the whole region. for example the SRI1086C GC, is recognized in Canada as producing data fit for trade. Hopefully, most readers recognize that the “problem” of processing cannabis raw materials is among many insidious results of our 80 year-old “marihuana” laws. In 1938, there were solid reasons why the magazine “Popular Mechanics” labeled cannabis hemp a “Billion Dollar Crop” (actual title of an article), and featured an early “decorticating” machine. Yet one year earlier, the U.S. Congress—acting entirely on the racist delusions of one heartless federal bureaucrat, Harry Anslinger—had already STOLEN our basic rights to grow cannabis plants, including hemp. The result is that we, as Americans, have lost out on the astronomical amounts of “wealth and protection” that Thomas Jefferson saw in hemp crops. Maybe it’s time to start arresting members of Congress—for every single day that they keep this wretched, un-American, anti-“marihuana” policy in place. It’s causing countless problems in our society, aside from senselessly squandering our federal, state and local resources. LOL I agree completely with everything you said especially to start arresting those idiots in Congress !! Make your voices heard Vote Dems Now !! And UKY has been researching for decades.. But yet at this price for machinery it is still excessive, mobile machinery capable of 10T/hr certainly doesn’t cost this much at all. Probably that 10 ton/hour means fresh and moist crop? 10 tons of dried stalks is a huge amount of biomass. The most efficient full factory sized hemp processing plants can theoretically reach 6 tons an hour, but in reality the capacity is about 3 tons per hour. These processing plants cost about 8 million dollars to build. Our company in Finland has developed decortication line with the capacity of 1.5-2 tons per hour. The cost of the line is about 0.5 million euros and it is possible to make fully mobile although it´s still about 40 meters long. Our first line was installed above three semitrailers, but we thought it´s too risky to move the only processing equipment we had. I m interested. Please reach me at office.oeko(at)gmail.com. thanks! 2 – 2.5 Million bucks? That can only be a prototype. No one will be able to pay this for a machine that produces a product for such a limited market. Also the structure of the current hemp farms leans towards smaller fields. If you wanted to open this market up, you have to significantly lower the price to something in the order of a combine harvester, ideally some less (since it’s more specialised). Kristin, Thank you for putting the time in writing the article on needed hemp decortication facilities. As stated there are many factors and variables that will play in the proper decortication for quality hemp seed & fiber bast. I believe it will be a process of trial and error, the latter you better make sure you at least cover your costs. Currently 34 states allow for growing of industrial hemp in different degrees. Planning procedures such as acquiring proper seeds, growing technique, maintaining, on top of navigating these new hemp laws will be arduous at best. These difficult processes are not going to be easy, but creating informative groups “team effort” has always been the best way. Here in Wisconsin we are hoping to approach this as a specialty co-op of suppliers, growers, cultivators, transporters, and product users. Education will be paramount to address these issues. I believe collectively working locally then connect nationally “we the people” (American Family Farmer) will again be profitable utilizing this great plant. But hey remember it’s been over 80 years of no growth since the US government stomped down this industry. Rude comments naysayers and lone wolf mentality doesn’t help, Solution Suggestion: hard work and positive morale. As a young country hemp was considered a staple crop if it becomes a center of trade here in this nation the Industry has to catch up with technology which has had an 80 year head start. I’m wanting to plant kenaf on 80 acres in NCF. Any advice? FB Harrell Hemp Company. Has anyone watched the video on this thing? It’s not a decorticator…it’s a shredder. Sharp says he’s going to buy the fiber from the farmers? For what? It’s doesn’t separate the hurd from the bast, it just shreds it all together in a pile. What would you do with that? my dear person with similar interest: Thimk! Housing is the most noble use for Hemp Hurd, It keeps dry for a long time, it mixes with lye to produce hempcrete. The skills necessary are not very hard to learn, just remember, each house must comply with local and State building codes to protect the people who live in them and the investments they make. Hemp stalk long fibers are used in China for creating fabrics, I think a cotton mill with some re-fit is a hemp mill. A factory that weaves cotton can easily, I thimk, weave hemp. Article outlines the issues with the industry. Anyone have a link to the company in Finland? Working decorticators are the holy grail for the hemp industry. a decordicator can be created by a Growers Co-Op. It is a motor, gas or electric, it is a series of rollers, it is two looped conveyor belts, Here in Canada we think like that, ever time you try to charge us 1.5 to 2 million $ for something we can make here. id love to see your process on making a decordicator! My name is Azael Gurrola and I am getting ready to start a farm in New Mexico where they just legalized hemp for cultivation. is there any way you can send me any useful info to at [email protected]?? I don’t know where to start ! Plan to grow hemp on 60 acres in Illinois but have not learned where to bring it to market anywhere near our farm.